The Start menu earlier had the command ‘Run’. You can start programs via ‘Programs/Search files’ or ‘Start search’, but you also want to execute commands directly. Right click ‘Start’ and select the ‘Properties’ command in the next context menu. 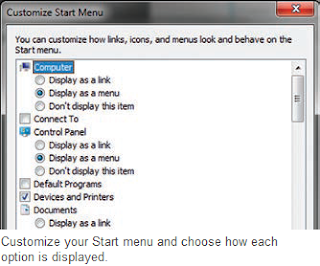 Then click the ‘Modify’ button in the ‘Start menu’ tab in the ‘Properties of taskbar and start menu’ dialog. Then check the box against ‘Command: Run’ in the list from the ‘Customize’ dialog. Confirm this action with ‘OK’ and exit all dialog boxes with ‘OK’. Now you will again have the ‘Run’ command that you have come to like for direct access in the start menu.